It is certainly easy to estimate the production period for this pen. I came across this coupon which clearly shows an April 1942 date for the promotion of a Waltham Button Filling Pen, with Visualated section to gauge the ink supply. All for $.35. Not bad, when compared to a $3.50 pen that has the same attributes, but no personalization or streamlined design. I wonder if the pen that they were using for comparison was the Parker Duofold, or Striped Duofold? They were the predominant button fillers of the period and before. Here is a photo of the pen after I took it apart. The nib is gold plate as is the clip and cap band. At 35 cents, who could complain? The button filler is a bit different than the Duofold in that the metal unit is one piece (embedded) and screws directly into the barrel. The button on the Duofold is a lone piece and not part of a unit, pulling directly out of the barrel. I did not unscrew the button unit and fortunately the pressure bar was in great shape and I did not need to craft another. As you can see, the bar has a pointed end which clicks into the button inside the barrel. After cleaning the inside of the cap and barrel I reset the bar into the button. The section is a see-through version and had to be scraped clean of old sac remnants. As I mentioned above, the furniture is gold plate, so I gently cleaned the clip, band, and nib. You can see that most of the plating had already worn off the exposed parts of the nib, so I merely polished it up. The cap band was the only part of the pen to retain much of its gold color. I inserted a size 18 sac into the barrel after coating with pure talc and cementing it to the section/feed/nib. The button filler works well and the pen held water overnight and it released a steady stream. Here is a photo of the completed Waltham Pen, a 1942 button filler. It measures 5 inches closed and 6 inches posted. This photo shows the visualated section, marketed as an ink viewing feature. The nib reads “Waltham / Duo-Way”. The imprint, in “Genuine 23 -Carat Gold Leaf” as shown in the above advertisement, reads ~ Gaylord Hagge ~ as shown below. I do not have any background on the Waltham Pen Company, or brand of pens. Waltham was a name that was well-known as a producer of watches and located in the Boston, Massachusetts area. The mail-in offer for this pen was to the U.S. Name-Plate Company in Chicago. 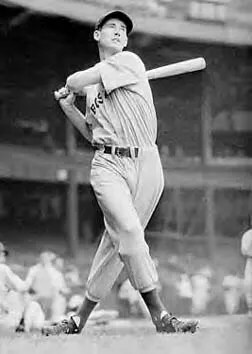 Another piece of the puzzle is that the celebrity name on the mail-in offer pen was Ted Williams, a popular baseball player for the Boston Red Sox during this time. Clicking on his name will link to his baseball history and statistics. 1942 was certainly a time to use Williams in advertising as he was fresh off an incredible season where he hit .406, the last player to hit over .400 in a season. 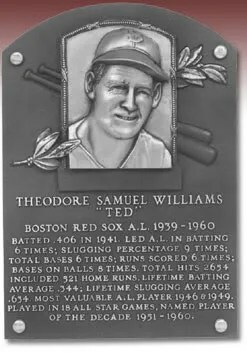 It is not certain that the name on the ad is “the” Ted Williams, but the timing leads me to believe the intent is there . 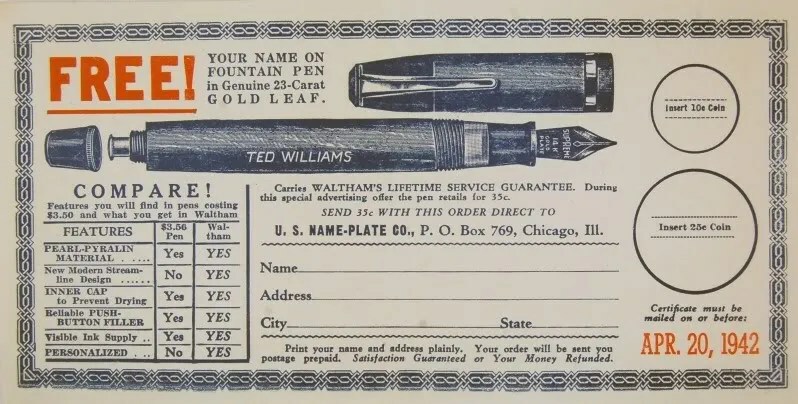 Perhaps these pens were produced in the Boston area (Williams / Waltham Watches) or in Chicago (U.S. Name-Plate / Button Fill). I have also seen an advertisement for Phoenix Pen and Novelty in New York City that produced a Waltham Combo pen in 1931, though I do not know if they are related. Finally, here is a link to a December 13, 1942 (after the above coupon expired) newspaper advertisement in the St. Petersburg (FL) Times. Waltham Pens (the ad appears directly to the right of the linked article) The retail price at the drug store has now risen to $.59, but the offer of printing still stands. 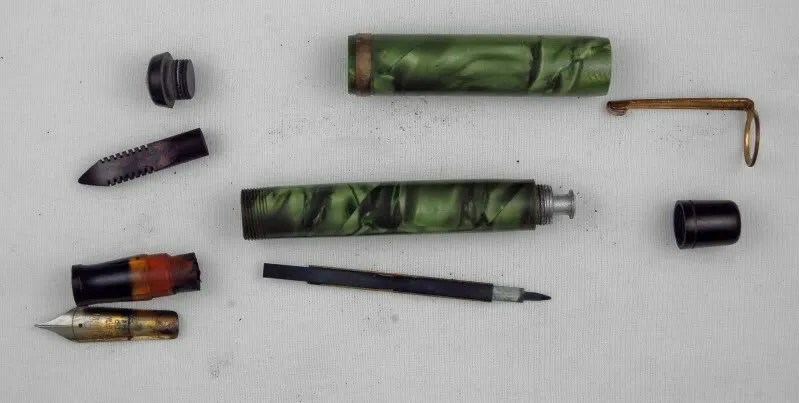 I hope that an astute pen historian will comment with more information and I will add to this article if I receive further research. Here are a couple of photos of Ted Williams, one being his plaque in Cooperstown’s Baseball Hall of Fame. Waltham pens are still plentiful and fairly easy to find in the vintage pen marketplace. They are fairly well made, though firmly placed in the third tier of vintage pens. I have also seen some Fountain Pen / Pencil Combinations that they produced. With little resale value, it still provides a unique peek into third tier advertising, and even a link to one of baseball’s finest hitters. Thank you, Antonios for this information.